What type of charts are available? I don't see certain fixed stars in my charts. How do I fix this? How many Fixed Stars are available? What House Systems are available? Tap or click over the screenshot to enlarge. Where's the setting for Bi-Wheel orbs (inc Transit and Returns)? 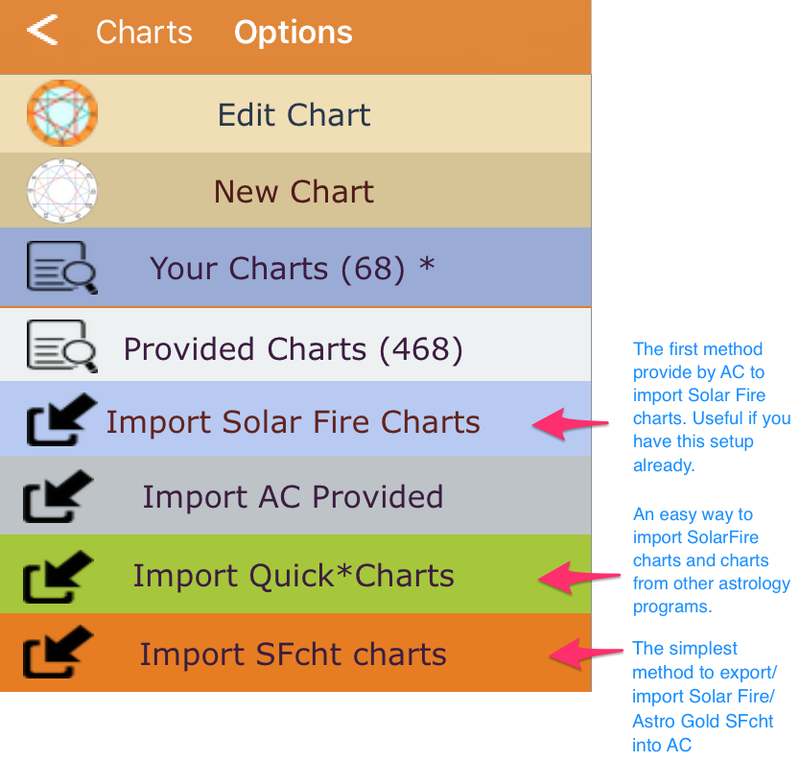 Antiscia: Tap Lightning Bolt icon, top menu when an Antiscia chart is displayed or from Chart Calcs menu. OR Transit bi-wheel orb settings. Long-press over Transit menu button to show the Transit bi-wheel orb settings view. I'm new to all this. 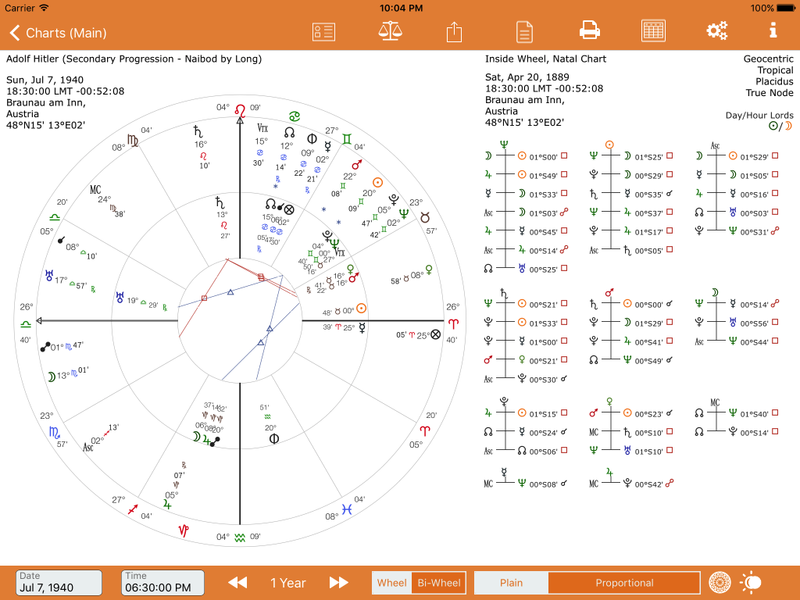 How do I create a new natal chart? I've found a bug. What should I do? If I report a bug how long will it take before it's fixed? It depends. If the bug report comes with screenshots and a way to replicate the bug, I will fix asap, probably the same day. Note that once I deploy it to Apple they can take 1-2 days to release it to the app store. Usually, it takes about 2 days. 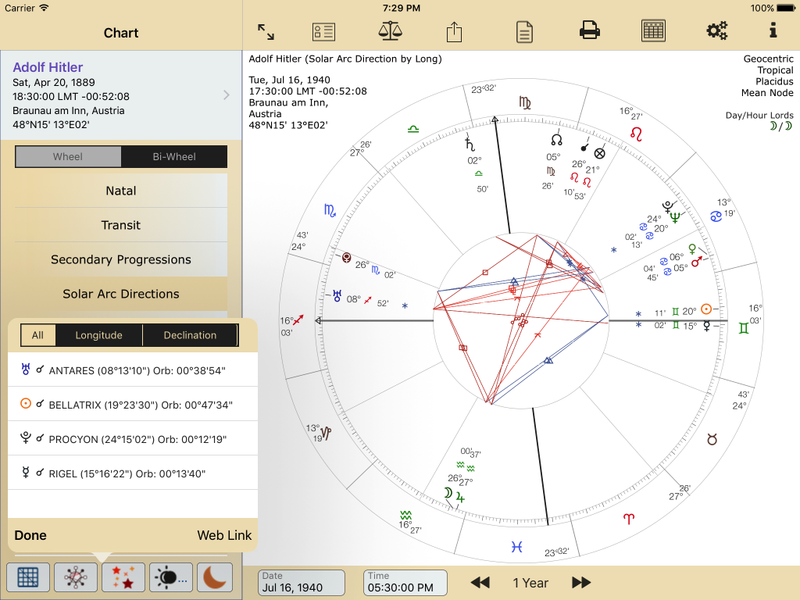 What are the red/black stars on the chart? 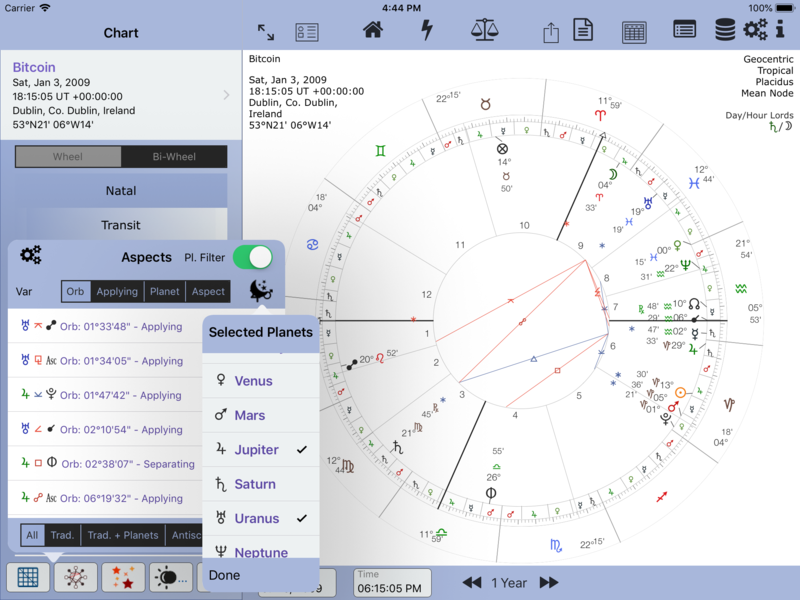 Fixed stars in conjunction, by long or parallel, to planets or points. I want to 'progress' a horary chart (for a day or hour) in real-time. How? 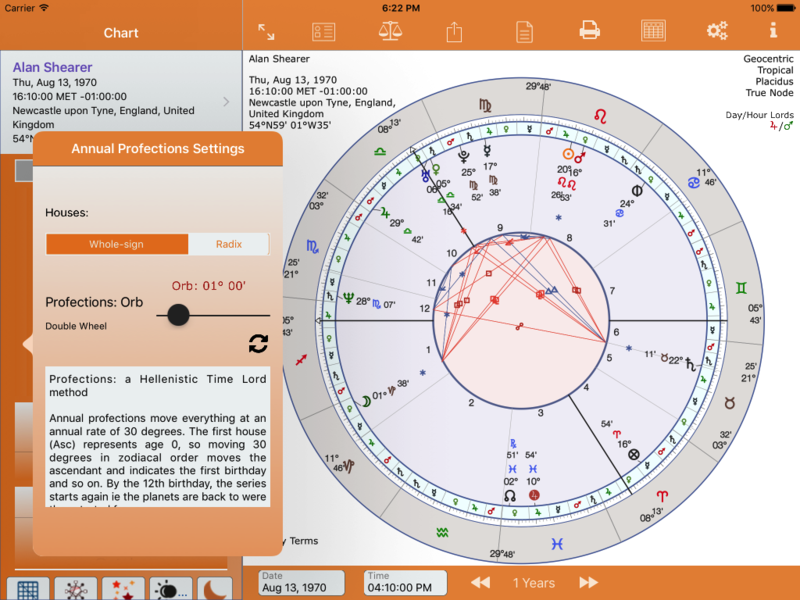 Given that a natal or horary chart is fixed, how is this possible? Easy. 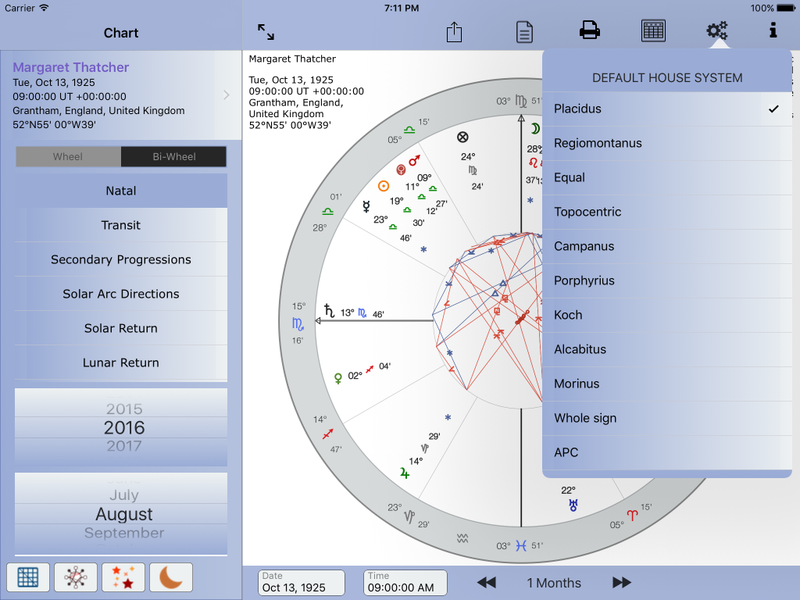 Just tap the advance in time button once and the chart will change to a transit chart with the same date/time/place of the horary chart. Now you can advance/progress the chart in real-time. There's a feature I'd like to see implemented. What do I do? It may not happen for a few weeks or months, but if it's something that other people would find useful I'm sure it would get implemented. For all types of charts. 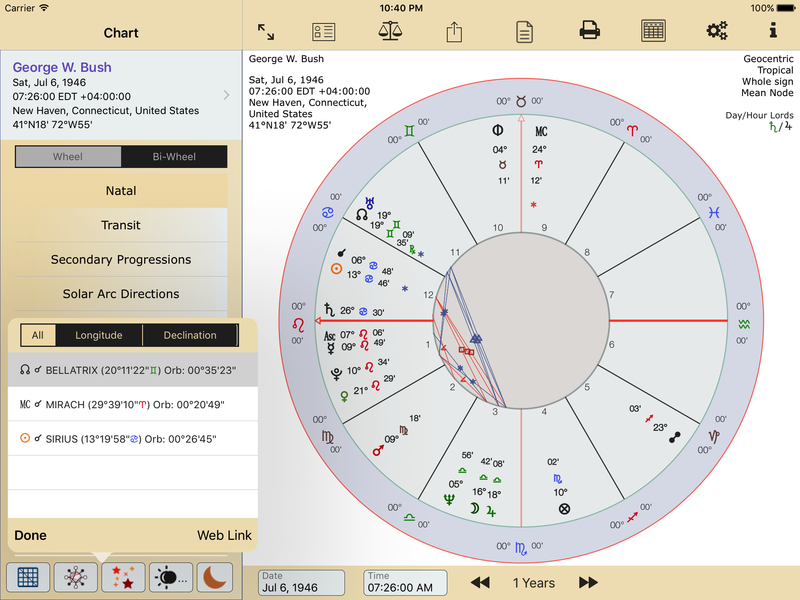 Please note Synastry comparison charts are bi-wheels by default as are Antiscia charts. 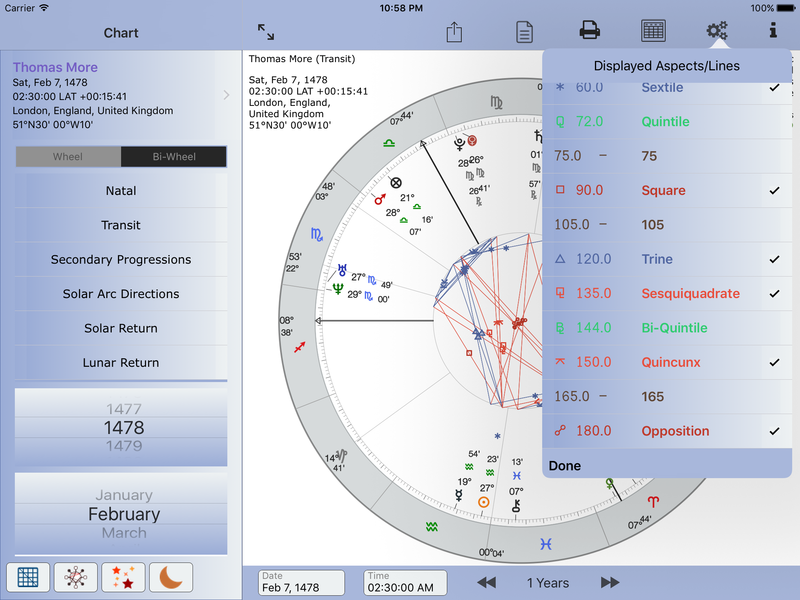 Gauquelin charts are by default natal. Bi-wheel is therefore not applicable. Can chart bi-wheels be animated? 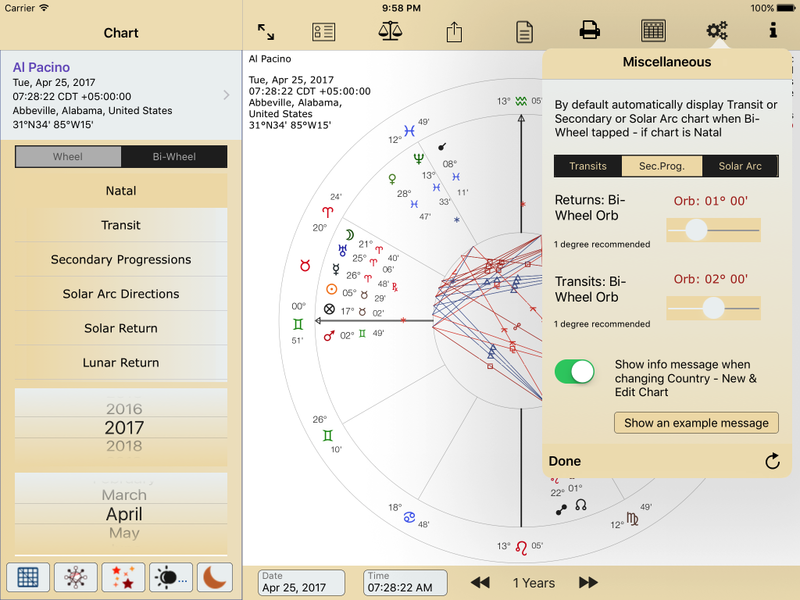 Yes, if you mean can the outer wheel be moved (while the inner chart remains stationary) by whatever time scale is chosen. 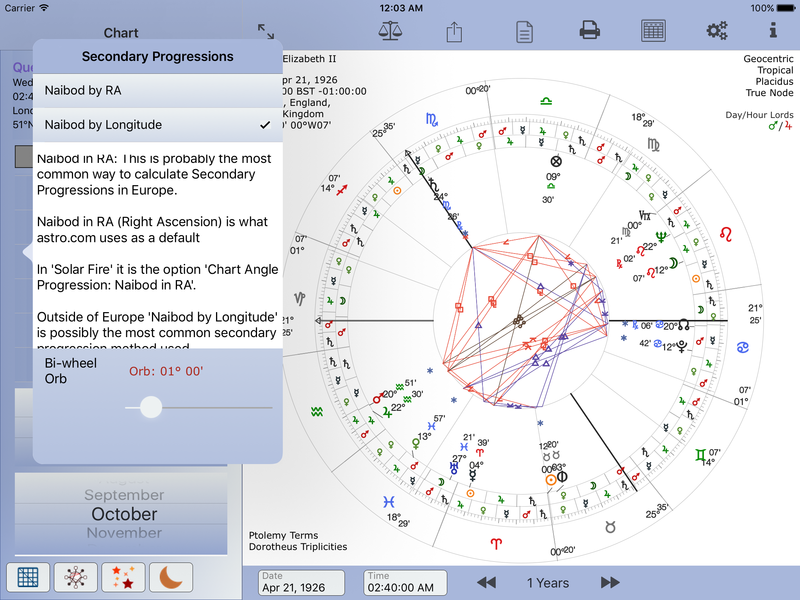 For example, if a secondary progressed (Naibod by long) chart is selected as a bi-wheel, the outer chart is progressed using that time scale, as would be expected. 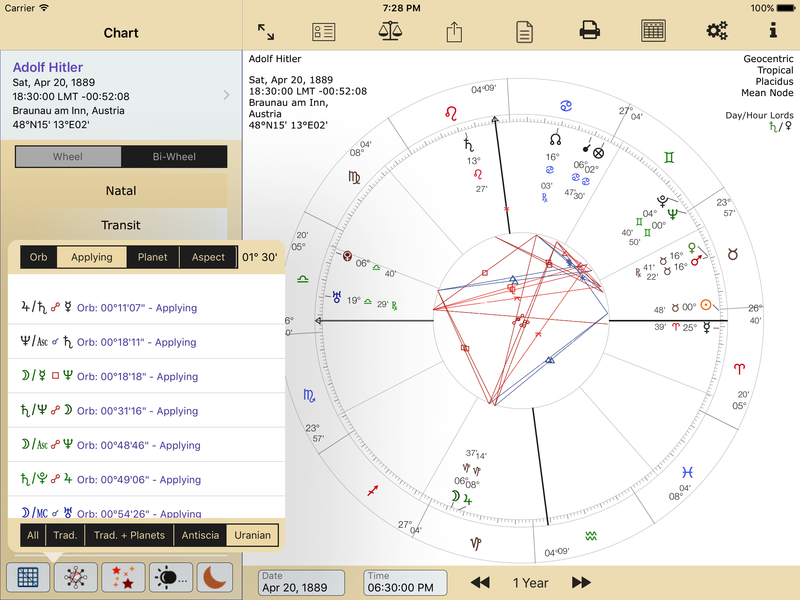 Apart from Returns and Synastry comparison charts. These cannot be animated in that way. However, Return charts can be saved (as radix charts) which allows them to be animated. 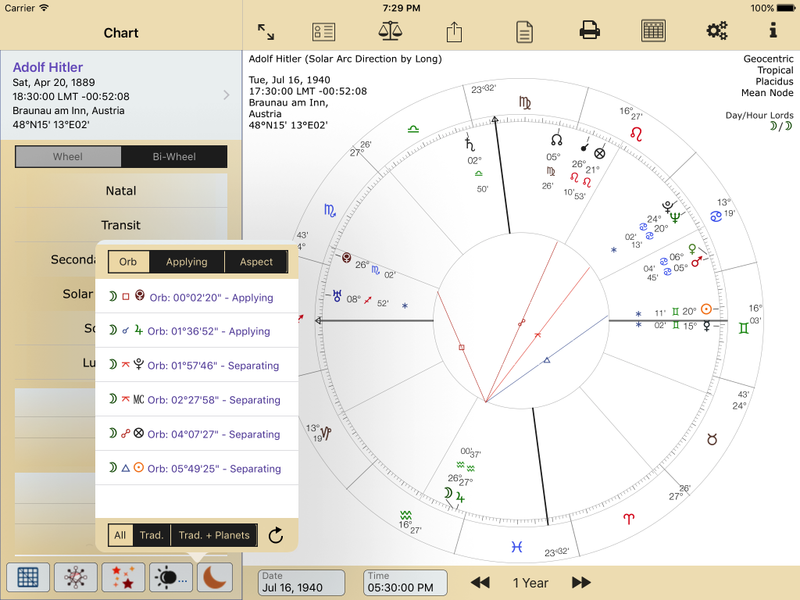 Aspects for midpoints are calculated for all charts. How can I view the chart notes? 7. Antiscia settings. Long-press centre of an Antiscia chart. 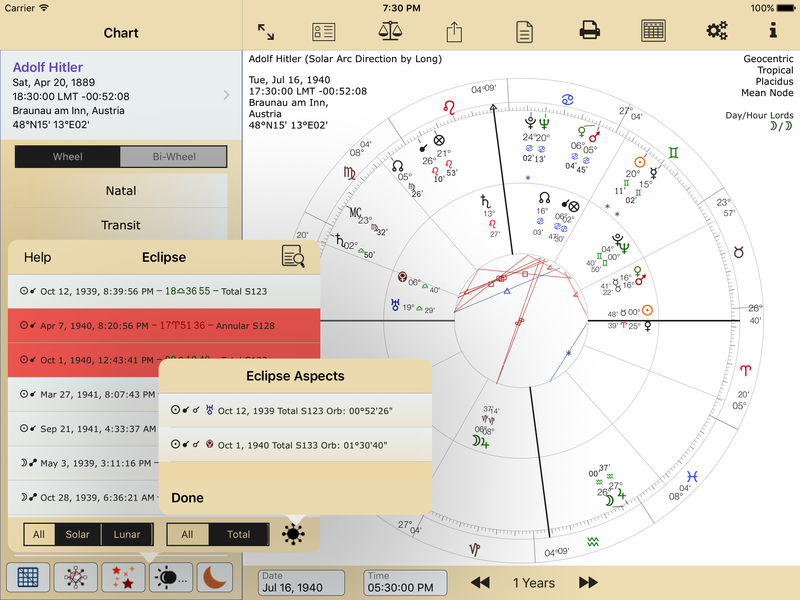 Tap the Lightning Bolt icon, top menu when an Antiscia chart is displayed. 7. Full landscape #3 Midpoint settings. Long-press over midpoint listings to show Midpoint Settings view. 8. Profections Settings. Long-press over Profection button to show the Profection Settings view. 9. 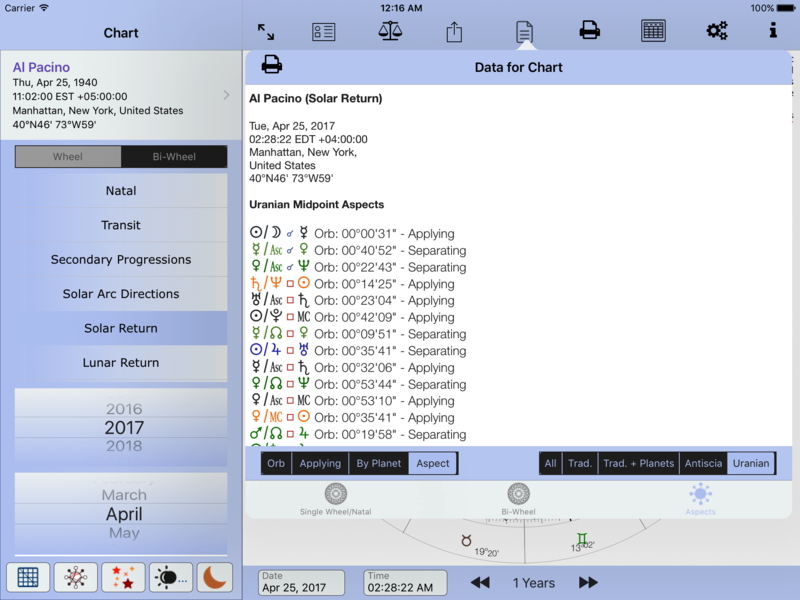 Pre-Natal Syzygy Settings. Long-press over Pre-Natal Syzygy button to show the Pre-Natal Syzygy Settings view. 10. Transit bi-wheel orb settings. Long-press over Transit menu button to show the Transit bi-wheel orb settings view. Can I choose which aspect lines are shown? I'm not interested in Declination. How do I stop them showing up in the aspect table? Un-select the declination aspects from the Displayed Aspects/Lines table. What time should I enter for the Time Of Birth? Clock time. Your local time. The time on your wristwatch or smart mobile phone. If a birth occurred in the evening, say 8 pm local time, then the time entered should be 8 pm. AstroConnexions takes care of the time zone and/or Summer time or Daylight saving time. How do I access the Aspect Hits and Time Map? 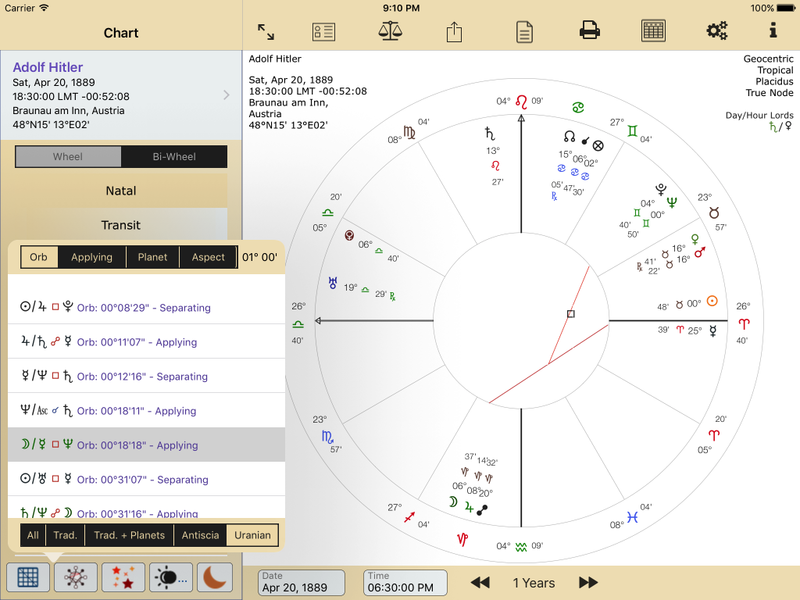 Tap the Lightning Bolt icon, when a natal/radix chart is being viewed top menu. The Time Map can be invoked from the Aspect Hit View. 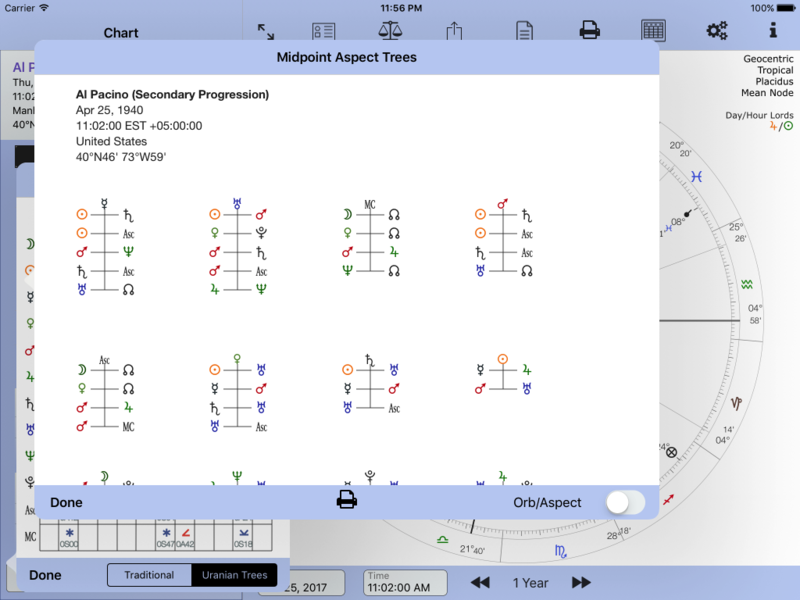 Note that Aspect Hits for Secondary Progressions "Mean Quotidian" is not currently available. 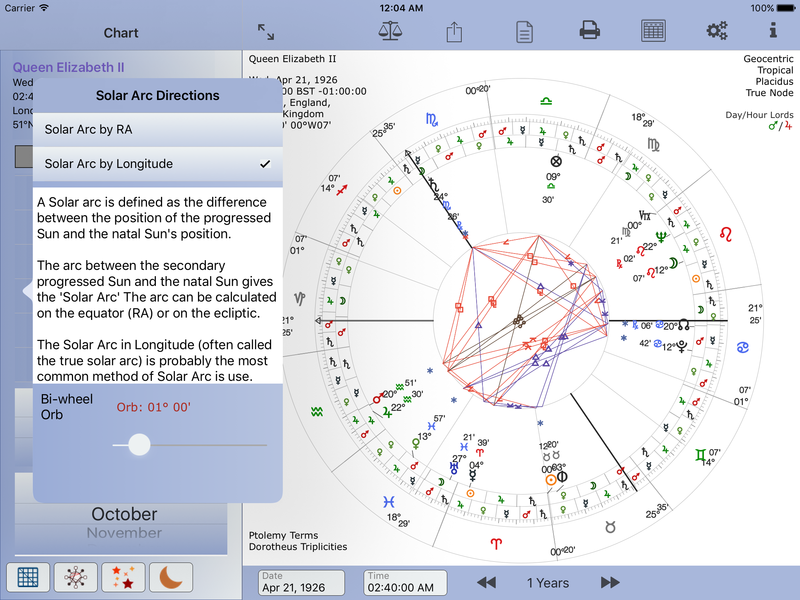 Tap the Lightning Bolt icon, top menu, when a Solar or Lunar Return is displayed. 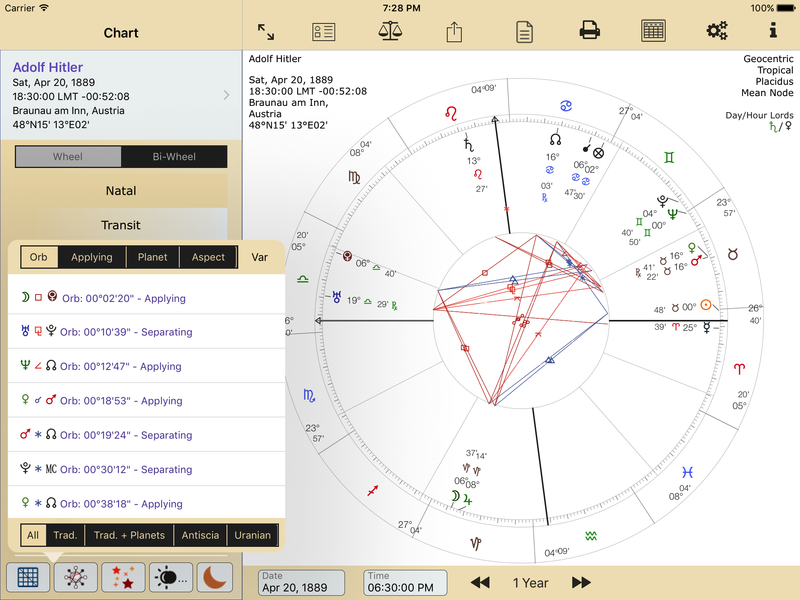 The aspect grid doesn't show my transiting (etc) aspects. Why? The most likely reason is that the orb setting is too small. By default AC's orb setting for a transit bi-wheel is one degree. Similarly, this orb size is used for many bi-wheels. 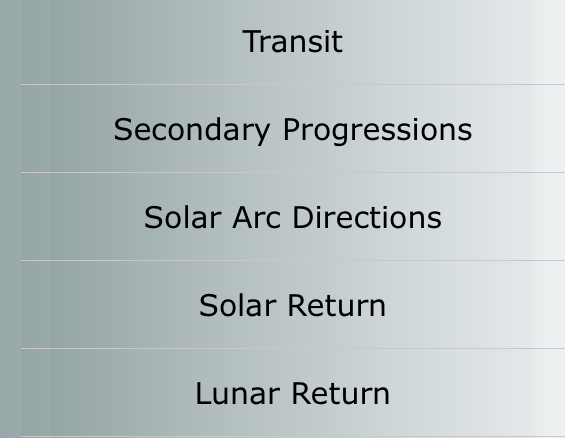 To change the Transit or Returns bi-wheel Orb go to Chart Calculations/Miscellaneous and change there. 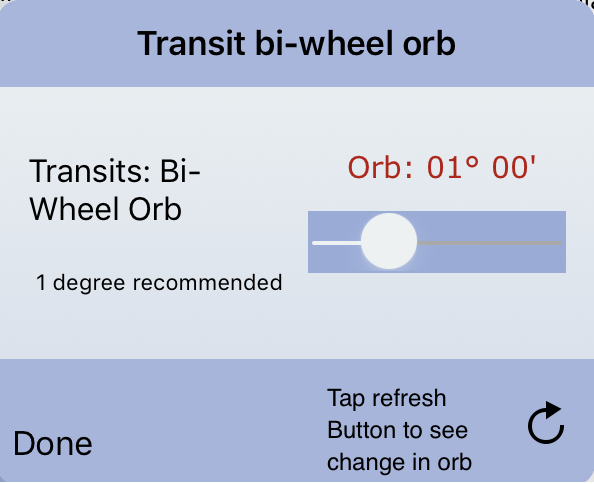 Transit bi-wheel orb settings. Long-press over Transit menu button to show the Transit bi-wheel orb settings view. What type of aspect tables are available? Is the Cosmobiology 90 degree dial available? Yes, AstroConnexions is Ad free. And always will be. No analytics are incorporated into AC. Many apps send data from their app with details of when and how you use it. AC does not. 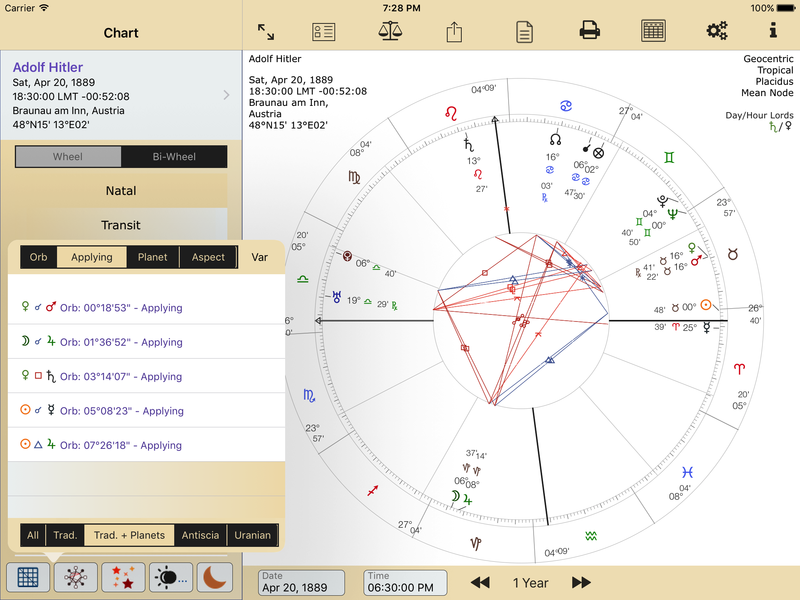 What's the best method for exporting my chart files (from other astrology apps) into AC? Here's a summary of the methods provided by AC to import you chart files from other astrology programs. Are there individual orbs settings for Eclipse and Ingress charts? No. They are classed as Natal/Radix charts, therefore, they use the natal chart (variable) orbs for single-wheel charts, and (fixed) orbs for bi-wheel charts. Variable orbs - this means that an orb for a square may be set at 8 degrees, whilst a sextile may be set at 4 degrees, etc. For bi-wheels, the setting is fixed often at 1 degree, so that a square orb is the same as a sextile orb. AC's documentation refers to variable and fixed orbs. What does that mean? Variable orbs - this means that an orb for a square may be set at 8 degrees, whilst a sextile may be set at 4 degrees, etc. Used by Natal/Radix charts. An antiscia chart may have a fixed or variable orb setting. For bi-wheels, the setting is fixed often at 1 degree, so that a square orb is the same as a sextile orb. For secondary progressions and solar arc, etc. This is common astrological practice, I believe. What are Transit to Transit aspects? These aspects are what's happening in the sky at any given moment. What type of iPad do you recommend? I've got 2 iPads. Are my saved AC chart files shared? I've got 2 iPads. Are my saved AC chart files shared? Or another way of putting it would be: if I save a chart file on one device will I be able to load it on the other? No. Each instance of the app has its own separate database. Of course AC chart files can be exported to DropBox and then imported into AC which goes some way in alleviating the lack of shared/common chart files. Do I need anything else once I've purchased AC? No. But. A free dropbox account - which you will have to get yourself - is necessary for import and export. Are there any in-app purchases or other things to buy? Is there a free, demo or lite version of AC? Can I get a free copy of AC? If you are an influential or popular astrologer, probably. If you have an influential or popular astrology website, probably. Is there an Android, Windows, Mac, on-line or Linux version of AC? But, when iOS merges with the Mac OS a version for the Mac may happen. How many people are involved in programming/developing AC? One, me. Roger Pearson. It keeps things simple. Are any Reports or Analysis of charts or aspects available? No chart analysis, but ver 2.08 will have aspect analysis for progressed and directed charts (not every aspect though).